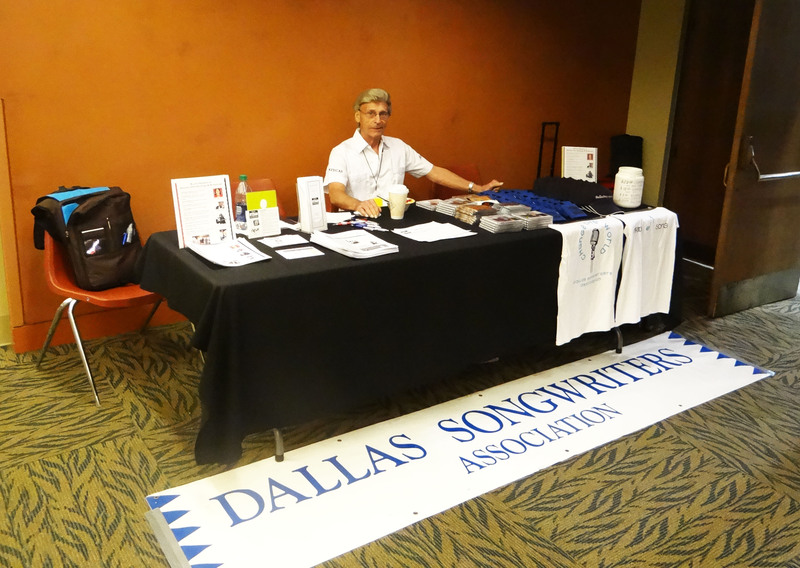 The second special event of October was the DSA booth at the Arlington Guitar Show on Saturday, October 17, and Sunday, the 18th. Bobby Montgomery set up the table on Saturday – and worked all day both days, God bless him! I joined him shortly thereafter – after waiting in line to park. I helped with the booth until about 12:30. I was watching the booth when Bobby stepped out for a bit. I looked at my phone and saw a notification from Facebook. It was one of those “what you were doing last year” posts that Facebook does, with a picture from a year ago. It was the picture I took of Bobby behind the booth last year at the guitar show. It looked similar to the picture above, but I think the table looked better this year. After a couple of hours I had to leave in order to host the DSA Showcase at the Farmers Branch Manske Library. I don’t know if any volunteers showed up to help Bobby after I left. I didn’t have a chance to browse the booths before I left. I did do one thing, but that is a different post. On Sunday, Bobby and I opened the booth again with a little help from my son, Cameron. Then I had the chance to wander around and drool at the guitars, amps, and accessories. Among the wandering and drooling, I stopped at the Guitars for Vets booth. I met George Jordan, head of the Dallas Chapter. George told me how the program worked. They give each vet ten guitar lessons. If the vet completes all ten lessons and shows interest, they give him a guitar. When I told him I was with the Dallas Songwriters, he got excited. They were trying to come up with something, after giving the vet the guitar, to keep the interest and effectiveness going. I told him the DSA would be happy to support them in any way we could. We have worked with many veterans over the years. If music and playing guitar can help them maintain, then surely songwriting would help. Without a doubt, they have stories to tell. For several years, Dallas Songwriters distributed a cd entitled Songs from the Soul of Service: A Collection of Songs written by U.S. Soldiers, Sailors, Airmen, and Marines. Surely telling those stories through song – or even spoken word over guitar – would be comforting in nature. I will be contacting George soon. Stay tuned for future development. Dickey Johnson and Michael Brandenberger arrived at the booth before I left in time to get Cameron back home to go to work. We talked to quite a few people at the booth over the two days. We have two pages of names and emails to enter into the mailing list and into a drawing for a chance to win a free year’s membership. If you are on that list, you should receive an email from me before too long.